E.leaven is a small bakery in the River North area of Chicago. They have a huge selection of freshly baked breads and bagels that are the main focus of their menu items. I think this restaurant succeeds because of their use of their fresh breads as vessels for their creative sandwiches and burgers. I was fortunate enough to find their Food Truck in Chicago, but I have been to their store location too. 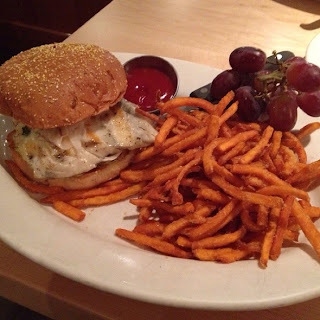 The items are reasonably priced but their menu is almost too extensive to choose from anything. I really like places that are good at a few items rather than offering a huge spread of mediocre entrees. Overall, my first impression was OK, mainly because they offer simple bagels and nothing really stood out or was memorable to me. Their sandwiches are all pretty tasty. But, just watch out and be prepared for it to be OVERCOOKED. Thick cut and extremely crispy! They did have a little too much salt at times and I just thought needed more seasoning other than salt. Maybe some pepper and olive oil. Just a suggestion. - Do try their breakfast items. I unfortunately forgot to take pictures, but they have excellent breads paired with some of the menu items. - I wouldn't go to the food truck. I think the warming trays due to the lack of cooking on the trucks makes the items seem overcooked. Home to the two famous Superdawg statues on the top of their drive in, this place is considered one of the greatest places to get the famous Chicago Style "Hot Dog." 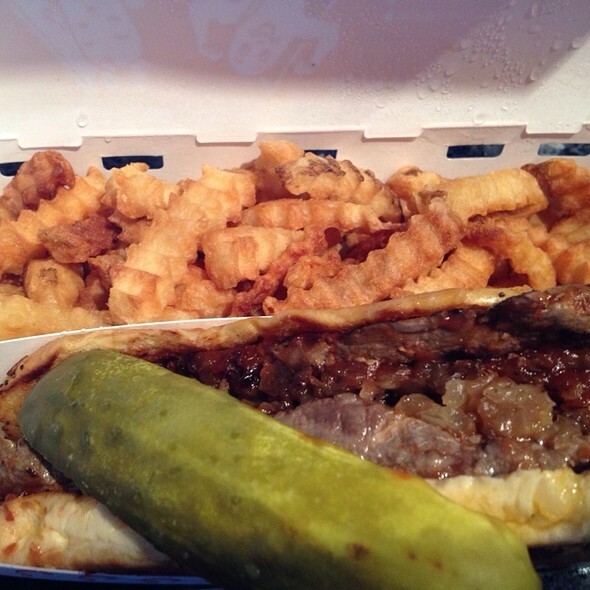 With all the perfect toppings, there is no place better in Chicago to try this hometown classic. (read below to see the toppings!) The only problem is the location of the restaurant. It is a good distance from downtown Chicago, making it difficult to get to on a daily basis. I wish they had such an amazing restaurant in the city. A must try! The superdawg... Finally made it to this amazing drive in. An all-beef hot dog with mustard, onion, neon green relish, a wedge of tomato, picked sports peppers, a dull pickle, and celery salt. All served on a steamed poppy seed bun. The toppings were perfect.. But, I do wish I had a couple more of the sports peppers. The hot dog had a nice crisp. The fries were not salted which was nice... you could add salt if you want to. All in all, it was an amazing meal... Definitely living up to all the hype. Another solid meal at this drive in... 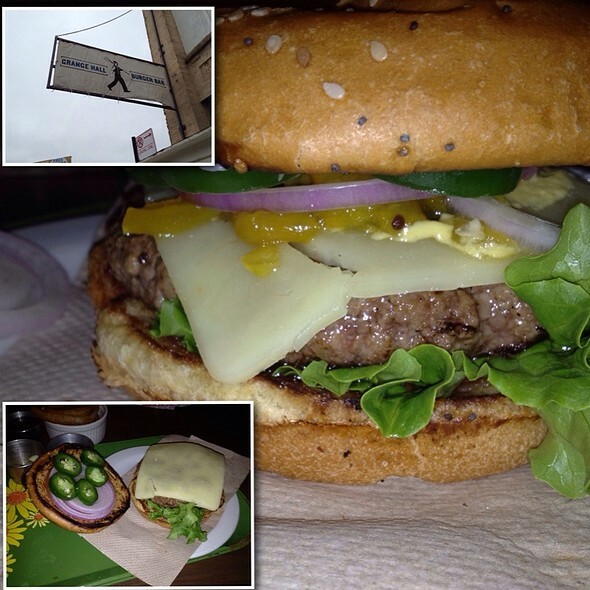 The bun was steamed too and the burger was juicy. With the grilled onions, hot peppers, and mustard... It couldn't get much better. And, once again that signature neon green relish covered the burger. Their spin on a BBQ brisket sandwich. It was a thick cut of meat, but unfortunately it was not very tender... Also, the BBQ sauce was too sweet for my liking. And then they added the grilled onions which made the sandwich even sweeter. I wasn't a fan of this sandwich. 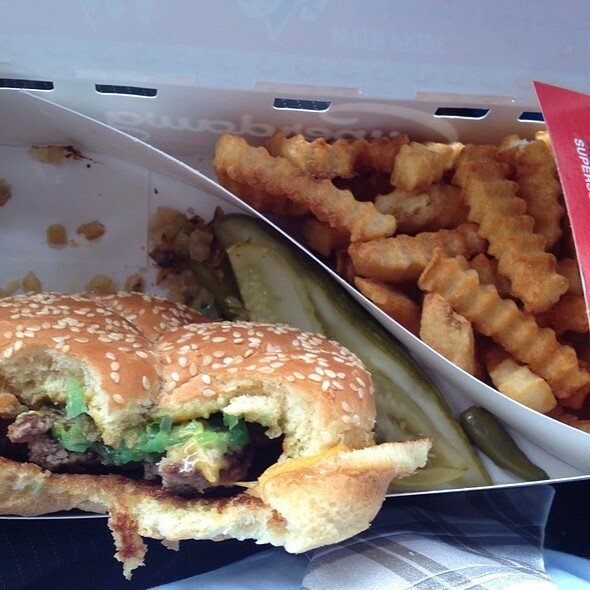 Just stick with the superdawg or superburger... Those can't disappoint, especially the superdawg! - When ordering, pull up to one of the bays and roll down the window. Place the switch to order and someone will talk to you through the speaker. They will then bring your food to your car. Once you are done, just flip the switch the finished or clear and they will come back to grab your tray. It may be confusing at first, but you will get the hang! 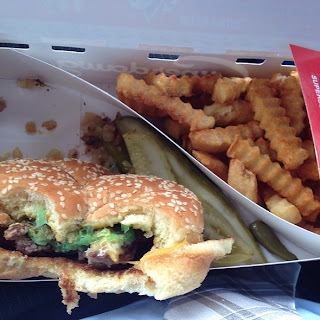 - Do order the Superdawg! 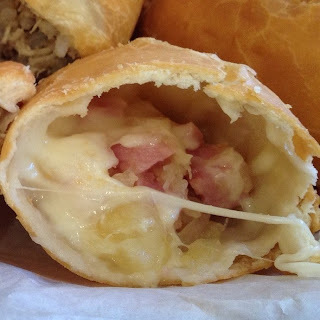 It is the best thing on the menu and I can guarantee you will not be disappointed. - Ask for extra sport peppers... 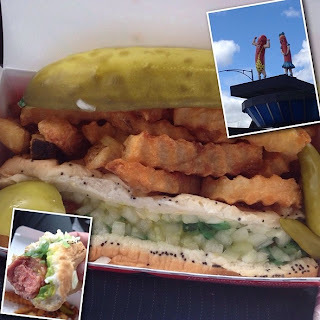 They come with a couple on the Superdawg but the more the better! - Don't call it a Hot Dog... people will be disappointed. - Don't ask for Ketchup... it doesn't belong on a superdawg and definitely on a chicago style "hot dog". 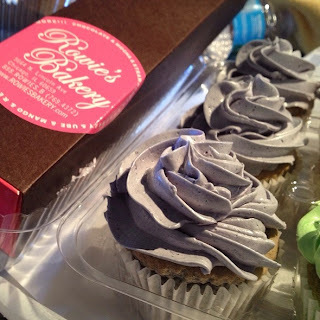 Another cupcake bakery in Chicago, but this place focuses on Filipino flavors. They make some delicious cupcakes but unfortunately some of them have an artificial taste in my opinion. 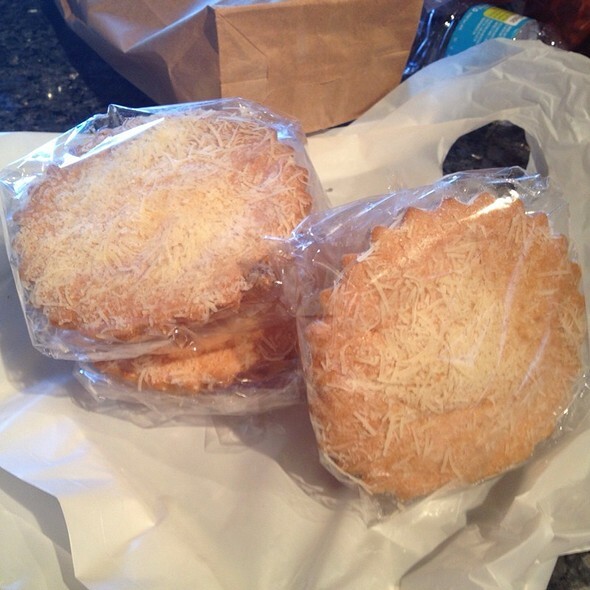 I do enjoy their Filipino bakery items like Mamon so if you have never tried them I suggest doing so. The reasons for the average rating are mainly because of the location, cost, and hit or miss menu. 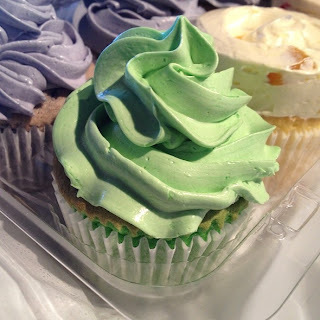 If you choose right, you will love the place... but the location is far from the city and it is expensive for cupcakes. They definitely have great presentations, but hiding under a complex presentation only works for a while. 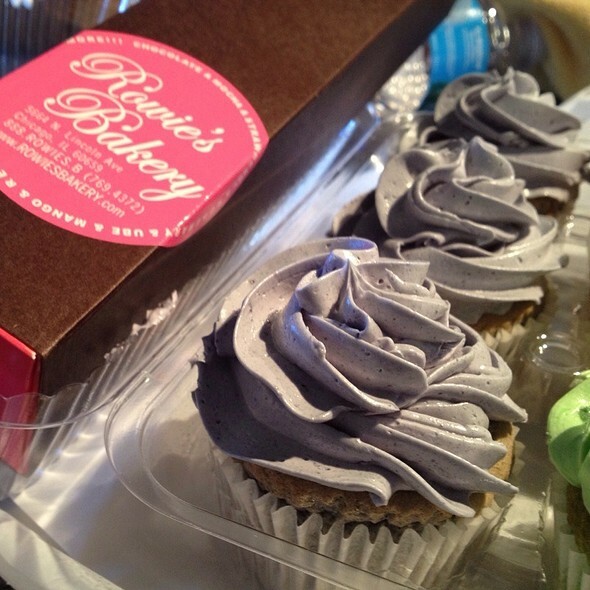 Finally a place with an ube cupcake!!! love ube and the hint of ube throughout is much better than those other places that make the ube too prominent and too sweet. The only thing keeping it from perfect is the minor artificial flavoring I can taste... Other than that... the cake is soft if gotten fresh and topped with an extremely rich ube buttercream with macapuno mixed right in. I would definitely get it again... but not for a while. A Filipino treat turned into a cupcake! The pandan cake was super moist and airy. 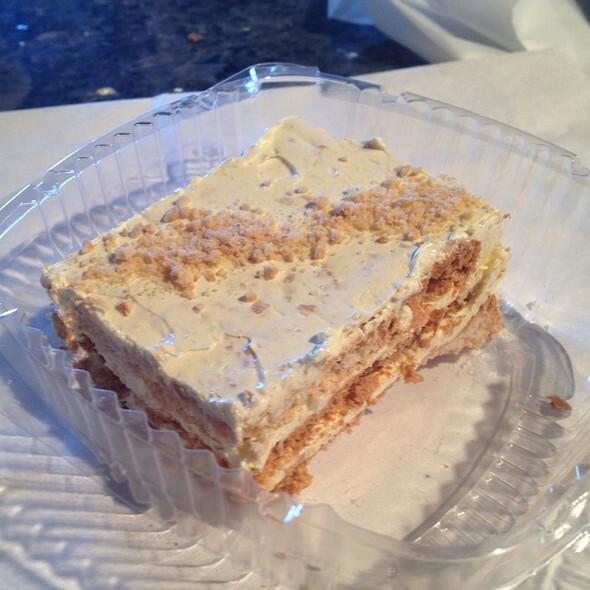 There seemed to be layer of coconut throughout. And the pandan buttercream... Never knew this was possible. Definitely recommended!!! Rowies also has circulating macarons. I wasn't able to try the ube one.. But I did get my hands on a strawberry lychee flavored one, a double chocolate, and I believe a tangelo or orange flavored one. All where nice crisp to the outside, soft and chewy middles, and well flavored creams. Unfortunately, they tasted very artificial... it was never too sweet but I always felt like I tasted a chemical after taste. This was delicious! The Mamon cake was soft and pillow-like. The texture seemed to just melt in your mouth. The cheese on top gave it a nice saltiness which contrasted well with the slightly sweet cake! Reminds me of ensamada! 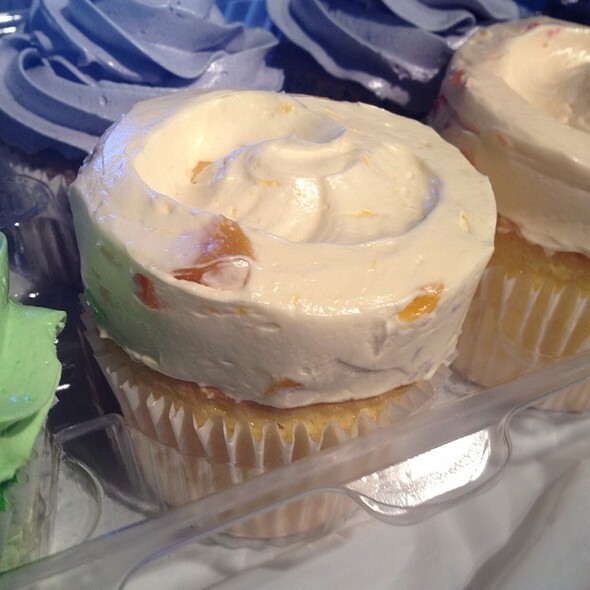 The "safe cupcake" at this bakery. Nothing but mango and mango... both the cake and icing have mango in it. Not too sweet but still a dessert. - Try some of the exotic flavors. They are interesting and something I would hope people would try! - Do come in the mornings... they are better when you get it fresh! - Don't buy too many. 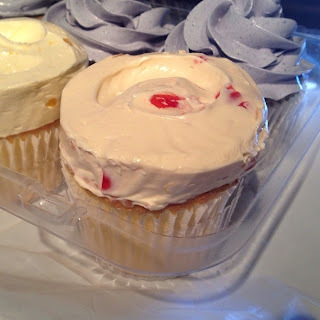 If you put them in the fridge, the cake dries out so fast making the cupcake almost inedible. I didn't like it at all. 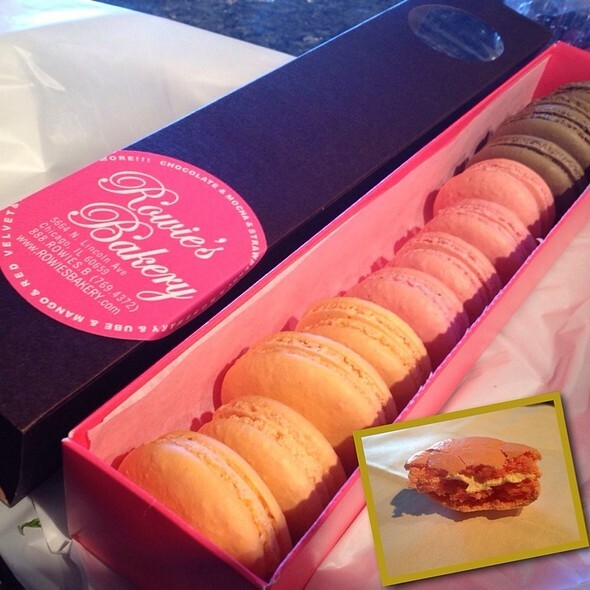 - I honestly wouldn't eat the macarons. They are ok for Chicago, but there are much better places. One of the more established food trucks in Chicago. They specialize in sliders which represent different kinds of food... (typical American sliders to Italian sliders). 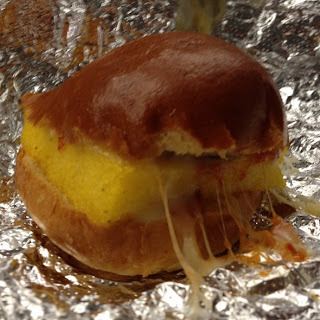 However, some of the sliders are sub-par... some are overcooked and others have amazing toppings. Just be careful which ones you choose! One of the better sliders. It has pulled pork, ham, mustard and of course a pickle. It was all served on a ciabatta like bun. 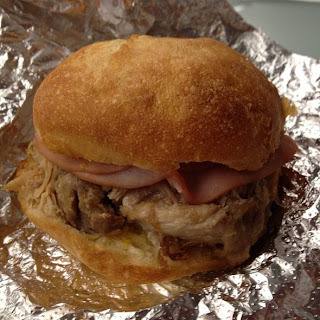 This one definitely had the most meat and actually tasted like a cuban sandwich. 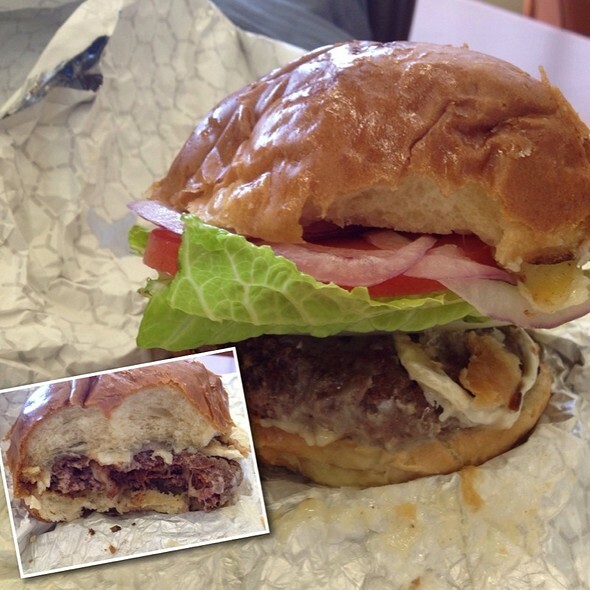 Just like ordering a burger from a neighborhood bar except for being overcooked... It had bacon and cheese an was serve on a sesame seed bun. It was cooked to a medium well which was disappointing for us. Not very juicy. I probably wouldn't get this one again. I understand why they always sell out of this one. It is packed with flavor from all that fatty pork belly. And the fennel apple slaw really pulled everything together. It gave the oily pork belly a fresh bite. Very good! Another ciabatta based slider... Unfortunately this one was not good. The chicken was extremely chewy and definitely overcooked. It did have a giardiniera and marinara sauce. Wasn't too happy with this choice. The vegetarian option on this meat happy food truck. It was a fried polenta cake serve with a marinara sauce and mushrooms and provolone cheese. It was actually pretty good! There are definitely better options out there though. - Do follow them on twitter. This is the best way to find out where the truck actually is parked for the day. 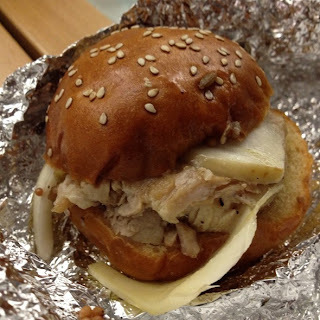 - Do order a sack for I believe $8... it comes with three sliders which is enough for lunch! - Don't eat the burger or the chicken... it is extremely overcooked mainly because they are sitting in a hot box for sometimes hours. I would stay away. This restaurant is located in the back area of the Foodlife Food Court in Water Tower Place. They are a sit down restaurant as opposed to the other food court style restaurants available. Honestly, I wouldn't choose this restaurant over the food court ones or even the M burger in the mall, but if you want a nicer, quieter atmosphere, you can definitely try this place. Their food is promising and has great flavors and nice portion sizes, but there is always something wrong with the dish that makes it average. And for that reason I gave it just a 3 mile rating. My first time ever having a "popover." It is hard to describe the consistence so here it goes.. It is a bread or a puff that is extremely light and airy on the inside and has a nice crisp on the outside... 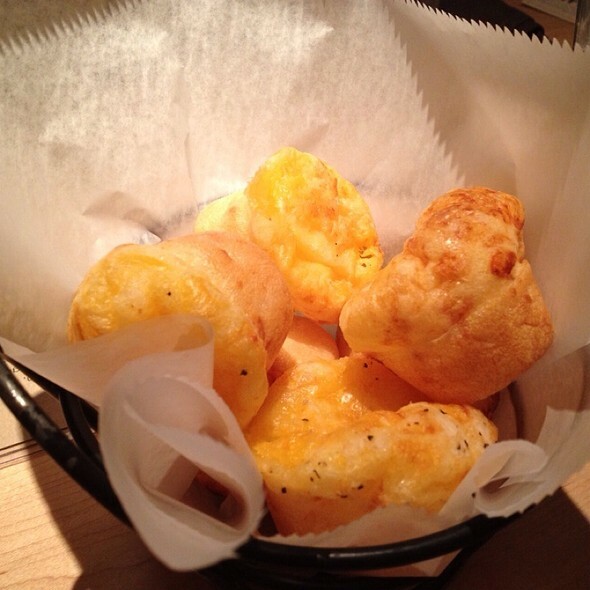 They are topped with cheddar cheese. I do wish they used a sharp cheddar but for a free appetizer they are delicious. A little oily so I wouldn't suggest stuffing your face with these. 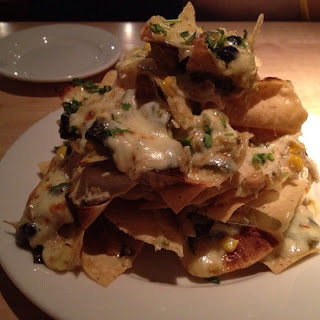 A pile of thin crispy tortilla chips topped with pulled rotisserie chicken, roasted poblanos, sweet corn, black beans, cilantro, pepper jack and chihuahua cheeses! The chips seemed too thin at first, but it was just thick enough to hold all these toppings... Tons of green chilies but unfortunately they had a little too much cheese... Also I wish it was spicy. The waitress said they would be but I didn't even get a hint spicy. 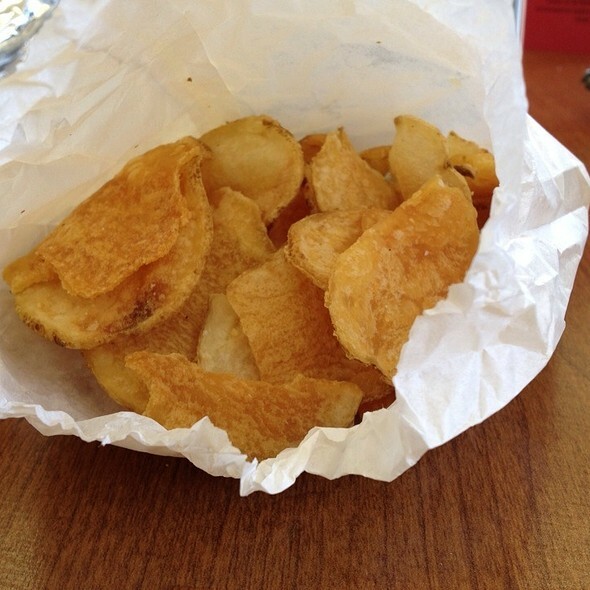 Also, the toppings are just layered on top so make sure to eat the bottom chips otherwise you will be left with a plate full of chips. A thick cut of halibut that was cooked nicely... it flaked apart when I tried the fish on its own. It was topped with pickled fennel and red onions and also a lemon caper aioli. The lemon aioli tied the strong flavors of the pickled vegetables with the fresh flavors of the fish. The flavors weren't overwhelming; in fact some bites were almost too bland if the bite was missing either the aoili or the vegetables. I was extremely disappointed with the side of sweet potato fries. For some odd reason, the sweet potato fries were sprinkled with both sugar and salt. The sugar was UNNECESSARY and actually ruined the fries. Hope they stop doing this... or make sure to request no added sugar. - So if you want to go to this restaurant, just tell the person near the food court and they will show you the way. But I am warning you, check out the food court first to see if any of the places sound appealing! - Do order the nachos but I would ask for a side of jalapeños or maybe chopped jalapeños added to them. - I wouldn't order the sweet potato fries ever again. They are sugared making them awful in my opinion. - Don't order dessert here... go out into the food court and get one of the fresh made crepes or huge pieces of cake or the giant cupcakes. You will be much happier! March 29, 2012 and many times after! J.P. Graziano's has been added to my list of favorite sandwiches in Chicago. They are a small sub shop at the front of their supplier style grocery store for the other delis in the city. I believe they have the most authentic italian style sandwiches... so good they actually remind me of the month I spent in Italy! Definitely a perfect rating and a must try! I guess it is always true; you must come to the source to get the best! 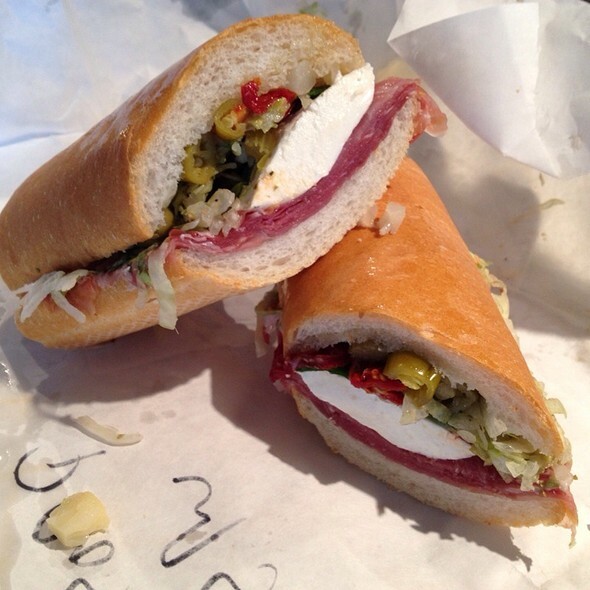 BEST ITALIAN STYLE SANDWICHES IN CHICAGO... Without question. Everyone needs to try it!! 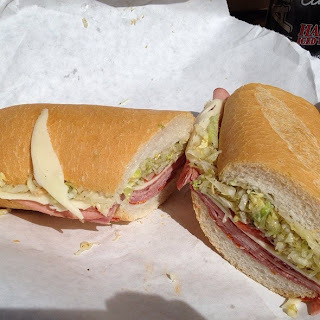 The Italian (which I can see why it is the most popular sandwich) had hot capicola, volpi genoa salami, hard salami, mortadella, provolone, tomato, lettuce and red wine vinegar with oregano! These are 9 inch sandwiches on freshly baked bread (nice crust with soft inside)! The meats are as fresh as you can get them. And the cheeses taste like they are fresh from Italy. I absolutely love this place and will try all their sandwiches soon! 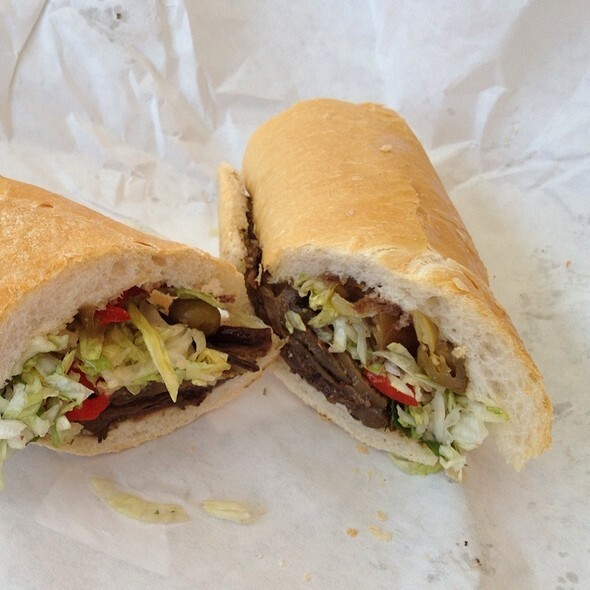 This is NO ORDINARY veggie sandwich. It's grilled marinated eggplant, fresh mozzarella, fresh basil, roasted red peppers, balsamic vinegar, hot giardiniera, and tomatoes & lettuce tossed in a red wine vinegar with oregano. The eggplant was thick cut and tender, the mozzarella was creamy, the balsamic draws out more flavor from the eggplant and peppers, and that hot giardiniera brought everything together. Served on the freshly baked bread with a nice crisp to its crust and soft inside. The bread soaks up all that extra juices and flavor! Prosciutto, fresh basil, fresh mozzarella cheese, sun dried tomatoes, lettuce, tomato, red wine vinaigrette, and hot giardinera! And all of that on freshly baked Italian bread. The mozzarella cheese is super soft and the sun dried tomatoes add that little bit of oil to cut through some of the freshness of the vegetables. Their giardinera is amazing but may be a little spicy for some. Fresh cannoli.... they make them daily and once they sell out that is it. 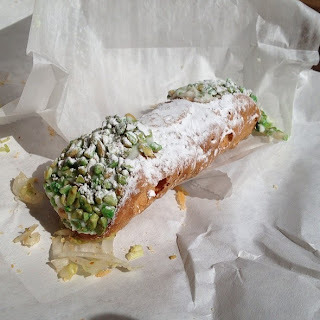 This one had chopped pistachios on the end. I couldn't ask for anything better. Amazing way to finish off one of the best sandwiches in Chicago! - How to Order: Walk in... go to the area where they are making sandwiches... check out their menu and additional add on ingredients you may like... tell the gentleman making the sandwiches whenever he looks at you... then walk in the fairly long line and wait to pay. After paying, come back to where you said your order and listen for when they call it out. It is a little confusing at first and I sure looked dumb doing all of this, but it is well worth it! - Do order their spicy giardinera on your sandwich... I forgot one time and will never forget again. - Do add the artichokes or sun dried tomatoes. 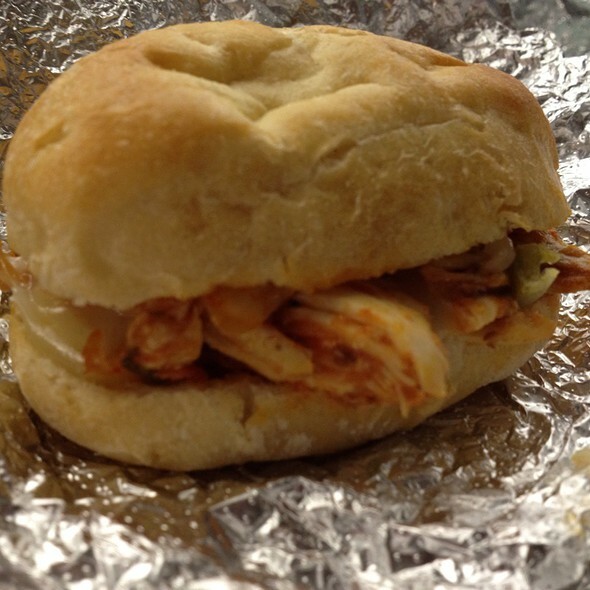 They are super fresh and add amazing bold flavors to the already complex sandwich! - Don't try to park real close to the place... there are rarely any spots and its better to park on Madison and walk. - Don't wait in the long line if you haven't ordered yet... read ordering instructions above! Honestly, this Latin American restaurant, with two locations in the city, reminds me of a casino. 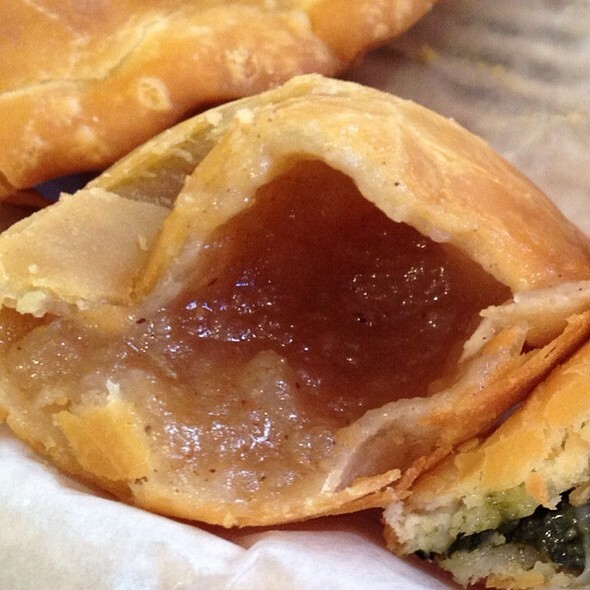 You gamble with the empanada you choose and hopefully you chose a "good one." 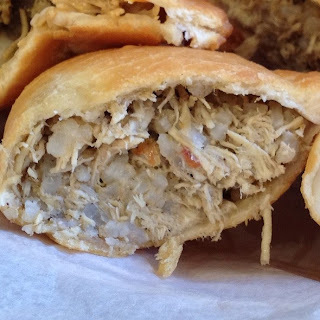 I was excited for this restaurant because of their "huge empanadas" but when actually seeing them, half are not stuffed with much filling and the others are just not well flavored. They do have a couple delicious, overstuffed emapandas but like I said its a gamble if you get one. And for those reasons I couldn't even give it an average rating. Use this review to help choose one of the better ones. Freshly fried empanada filled with chicken, cheese, sautéed mushrooms, tomatoes, and onions. Try it with their homemade hot sauce! 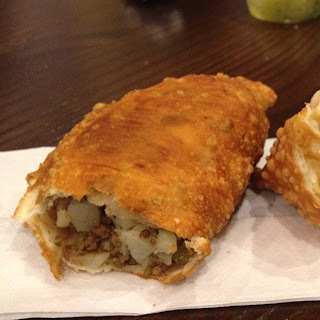 This fried empanada was filled with the classic empanada ingredients... ground beef, olives, raisins, potato, tomato, and onions. Unfortunately, the olive was overwhelming and the rest of the meat was bland. Disappointed in this item. An ok empanada... decent balance between the spinach and mozzarella cheese in this empanada... but the cheese was just too plain. Stuffed with tons of bbq chicken and potatoes. Nothing too special unfortunately. It was a little too much sweet bbq sauce. This crazy good empanada was filled with ham, mozzarella cheese, and pineapple. No sauce was needed... The sweetness of pineapple really comes through. 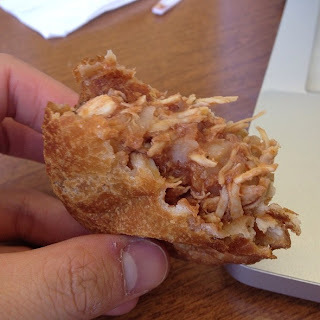 This empanada was overstuffed unlike some of the other ones we had. It was filled with shredded chicken, rice, tomato, and onion... Eat it with their spicy mayo or their special hot sauce! This one is NOT good... Literally was like warm apple sauce inside a fried pastry. Wished they used apple chunks. I do not recommend.. 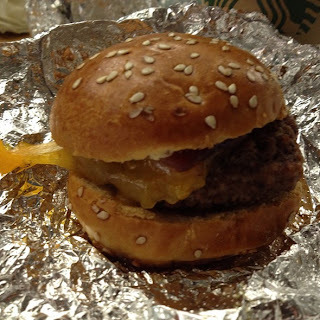 In fact we squeezed the apple sauce out and put their spicy mayo on it haha. 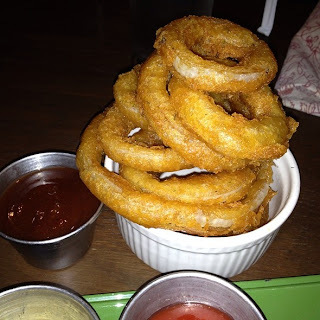 - Do use their homemade hot sauce and their spicy mayo sauce. 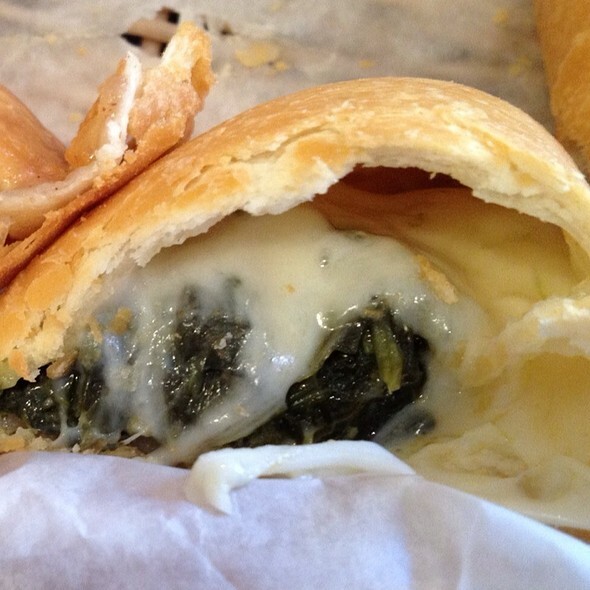 Both make the empanadas significantly better. - Do try the nutella and banana one. I really enjoyed it. In fact, I forgot to take a picture because I ate it so quickly. - Don't order more than three. These are fried and just too oily to eat more than three. - Don't order take out or pick up. These get more and more oily as the cool down. And they almost become inedible after an hour or so. I saw this restaurant on Diners, Drive-ins, and Dives and was really excited because it was close to my apartment. I drove down on a random weekday night and had a smaller dinner. The atmosphere was definitely country-esque and there was live music. I did enjoy some of the BBQ and was disappointed with others. And unfortunately I was disappointed with most of their sides. Sorry ahead of time because I didn't take pictures of them all... but read the DOs/DON'Ts section for further recommendations! Extremely thick cut bacon which is candied in brown sugar! The fatty section has an interesting texture that I crave. It is almost like eating bacon flavored sugar. The meat portion is more like a jerky. They have limited supplies and we got lucky enough to get some this time! 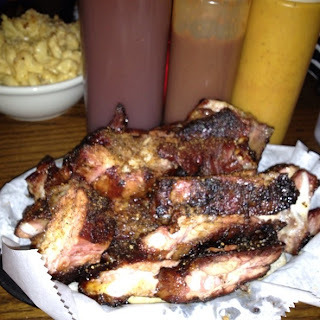 My favorite dish at BBQ joints. A huge portion of rib tips with plenty of bark and tons of meat! It was piled high on a slice of bread! In the background you can see their different BBQ sauces including a spicy one, a sweeter one, and a mustard based sauce. In comparison to other BBQ joints in the city... these rib tips were definitely a great deal. At $9.00, if you could finish the size of this platter than you have a huge appetite, because I couldn't. They did have good flavor and without pre-saucing them, it gives you the opportunity to try all the sauces and choose your favorite. Personally, I loved the mustard based sauce. 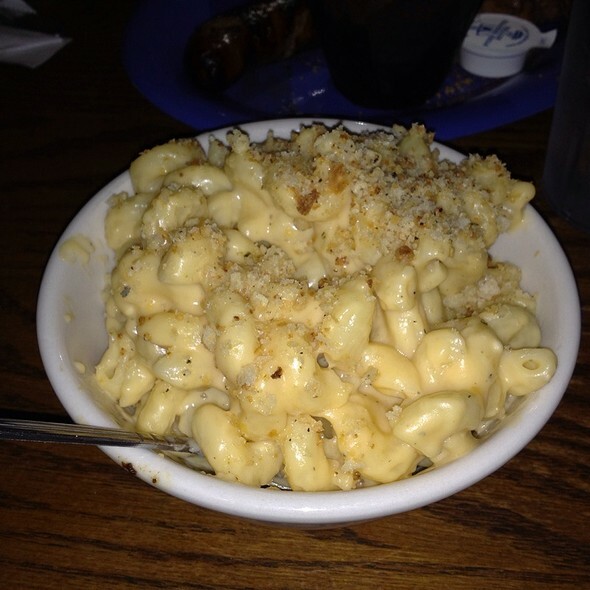 I don't know what I was thinking the first time I tried their mac and cheese. Maybe I got a bad scoop or something. I recently ordered Honky Tonk BBQ again and my friend wanted a side of the mac n cheese. Previously I thought it was to creamy and no crust. This time was the exact opposite. 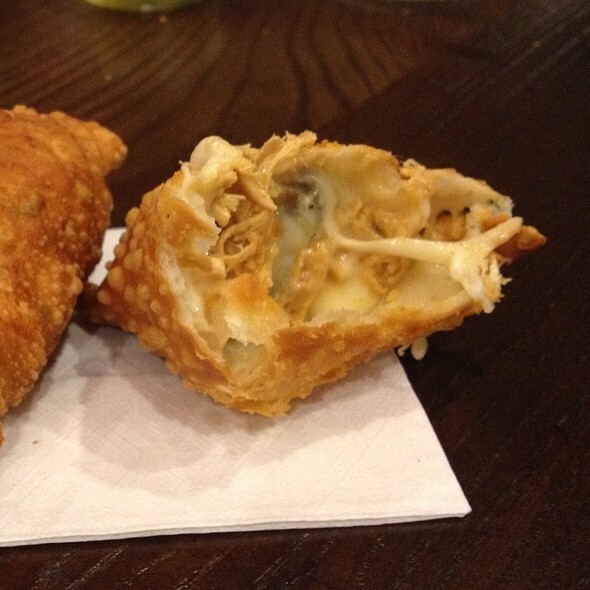 Perfect amount of creaminess and cheese flavor with a nice golden brown breadcrumb crust. It was excellent. The regular size is definitely enough for two people to share. I love added a little BBQ sauce to mine and a couple shreds of meat to spice it up. 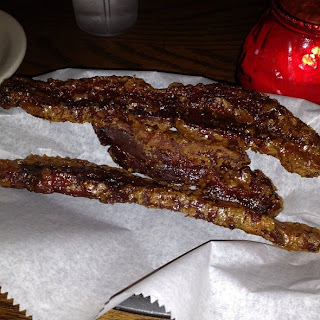 - Do order the candied bacon. It is an interesting dish and something everyone should try. - Use a lot of the mustard based sauce. It was definitely my favorite and most of my friends' favorite too. - Do order the corn bread. It is more of chunky fresh corn tasting bread. Not like the usual buttery dry bread that other places serve. - Do order the sausage link... it is delicious with lots of spices without being spicy! - Don't get the sampler platter. It is only an OK deal... I would rather order everything a la carte and switch the sides or switch something else out. - Order ahead of time and pick it up or get their early. Even though it is not the best BBQ restaurant in the city, it is always busy.